The British Gazette » Events, dear boy, events…. 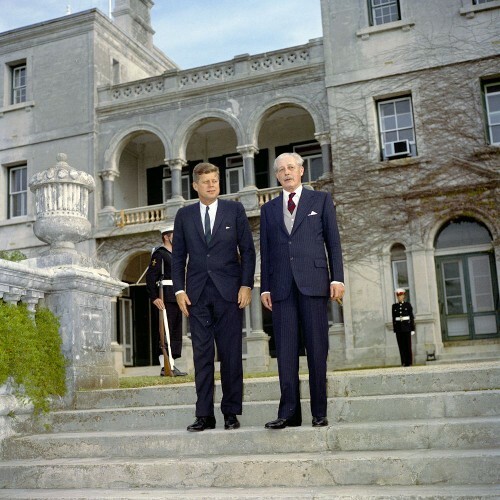 Above, President John F. Kennedy with Prime Minister Harold Macmillan of Great Britain in Bermuda on 22nd December 1961. Whatever it’s origins, it is a very good phrase which should often be in the minds of those charged with the affairs of government. And for those who advise same. This is because things do not take place in isolation. The phrase “No man is an island” is another one. This will apply to the Brexit negotiations once they get under-way following the serving of Article 50 notification. The image for today’s article was chosen because it is very apposite to the Brexit issue as it was President Kennedy who told Macmillan that if the UK wanted to continue to benefit from US support and the so-called “Special Relationship” then the UK was to seek membership of what at the time of the European Community (EC). The Treaty of Rome, officially the Treaty establishing the European Community (TEEC) was signed on 25th March 1957 by Belgium, France, Italy, Luxembourg, the Netherlands and West Germany and came into force on 1 January 1958. 1. No so called “independent” British nuclear deterrent. 2. Loss of the UK’s Permanent Member status on the UN Security Council – and with it the veto. President Kennedy was able to apply extra pressure on Macmillan due to his late sister, Kathleen Cavendish (née Kennedy), Marchioness of Hartington being one of the Cliveden set who met at Cliveden, the home of Nancy Astor in the 1920s and 1930s. In other words; Kennedy had Macmillan over a barrel. Now we turn the clock forward to 2017. Of the government’s White Paper (https://www.gov.uk/government/uploads/system/uploads/attachment_data/file/589191/The_United_Kingdoms_exit_from_and_partnership_with_the_EU_Web.pdf) we can dismiss it as 24,568 words of aspirational waffle. Here is an irony. Whilst the process of Brexit will be an incredibly detailed and complex process, cutting to the chase of the raw politics can be brutally straightforward. As it was for Macmillan (and by extension the UK) in Bermuda in December 1961 so it will be for the EU in the negotiations between 2017 and 2019. In BOTH situations the figure of the President of the United States of America loomed large in the background. For Macmillan and the UK it was John Fitzgerald “Jack” Kennedy, 35th President of the United States. For the EU it is Donald John Trump, 45th President of the United States. Now it is at this point many of this organ’s readers who are fervent Ukippers will firmly grasp the wrong end of the particular stick we are writing about. The wrong end of this stick being the delusional belief that President Trump will agree to negotiate a “trade deal” with the UK which will ensure the UK can do “a hard Brexit”. This is of course complete and utter nonsense! 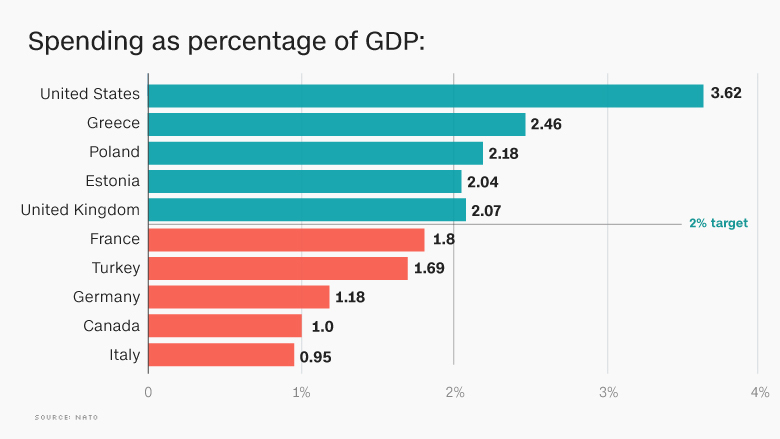 “The Donald” is not happy with the level of defence expenditure made by most members of NATO. This is best illustrated with a recent graph: Previous US administrations were also unhappy but we can be fairly certain that given his recent track record “The Donald” will be a little more assertive! Madam May was widely criticised by the Snowflakes for going to Washington DC so early (this was seen – correctly – as toadying) and be seen to “appease” “The Donald’s” later actions on the migration issue. Madam May however managed to extract some form of attenuation of “The Donald’s” attitude towards NATO and it’s usefulness. Madam May is clearly intent on steering a perilous (peril is unavoidable) course through the Brexit negotiations. She will seek an outcome that does not wreck the UK economy. This outcome is of course known. It is EFTA+EEA or “the Norway Option”. This of course will not be able to be described as anything other than what it is. Therefore she will attempt to manoeuvre Labour, the Lib-Dems and the SNP into imposing constraints upon her negotiating position by a series of Parliamentary votes – which the Tories will loose. This will enable Madam May to lay the blame for what UKIP will declare “a sell out” and a “half way house” at the feet of the Unfortunate Comrade Corbyn. The DANGER faced by the UK is of a failure to make a deal – AND get it ratified by all EU Member States – WITHIN the two year countdown to Brexit. Negotiating Brexit will NOT be easy. Even if Madam May was to negotiate for EFTA+EEA status from the outset the DANGER will still be present. This is because other EU member states will try and press for particular concessions to their advantage. In other words, if the UK were to emerge with a deal that was in effect the same as Norway’s it would be a spectacular success! Given the pressure of the clock and the “cliff edge” and the appearance of this phrase in the White Paper shows that HMG is aware of this, other EU states will seek to press home their advantage. Their problem however lies in their own enlightened self interest being the less popular option – for them in relation to their own voters. IF by their actions they cause the UK to crash out of the EU the consequences will be profound. Firstly the UK economy will crash by an order of magnitude not seen since the 1930s. Secondly the political effects – in the UK will be as severe. The upshot will be that the UK will no longer be the reliable defence partner and NATO member. This will increase greatly the burden on those EU members who are in NATO. Furthermore the train crash which will be post Brexit UK will result in a great problems for the EU. This particularly will be the case with the motor industry. In other words, if by their actions the EU member states cause the UK to crash out it will hurt them severely. It will also hurt the USA. Of this the EU members can be certain. “The Donald” will be one VERY angry bunny! So the Brexit negotiations will come down to this question: How to get the UK out of the EU and EEA and into EFTA and the EEA seamlessly! Madam May will want to be seen to be forced by Comrade Corbyn and Ms Sturgeon into accepting this “second best” option. She will also want “the Norway Option without extra costs”. She will resist EU member states offering “the Norway Option with extra costs”. The one thing we can be certain of is that there will be an attempt to push things to the wire. And it is here the DANGER lies. You see, the problem is not just the two year countdown to Brexit once Article 50 is invoked. It is the need of all remaining 27 EU member states to ratify the deal before the clock stops ticking. This Dear Reader is the DANGER! That a “deal” is reached within the two years but it FAILS to be ratified in time due to one or more EU member states failing to ratify in time! IF this happens “The Donald” will vent his fury. You can be 1,000,000% sure of that!